We retired from full time jet boating in 2018 so the business and / or the boat is now for sale. What happens next depends on who takes on the boat / business and when. 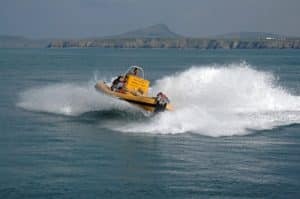 We've enjoyed some great jet boating so far in retirement and while we have the boat we’re likely to do some jet boat trips or charter this summer, albeit on a much quieter scale. Please see Facebook and our blog for updates. Step 1: choose the trip you would like, the number of adult and child tickets you need and pay by Paypal below. Thank you! Paypal will give you a link to our pre-trip information page after checkout. Step 2: fill in the contact form below with your mobile telephone number and your preferred dates and start times (approx): 10am-12pm, 11am-1pm, 12-2pm, 1-3pm, 2-4pm. Step 3: agree the terms and conditions, add any special requirements / interests for the trip. That's it! We will confirm your booking by email or text as soon as possible and certainly within 24 hours. Please see Additional Information section below. Please note that this is a provisional reservation subject to sea and weather conditions and availability. It is not a confirmed booking until we send you confirmation of that booking by email or text. All trips, even with confirmed bookings, remain subject to sea and weather conditions for safety etc. We are unable to confirm online bookings without email addresses and contact telephone numbers. They will only be used to contact you in relation to your booking eg if we can see any potential issues with sea or weather conditions. Please confirm your preferred dates and times and any special requirements / interests on the contact form or by emailing us at info@venturejet.co.uk. For your own convenience please tell us if you are available other days / times if your preferred time is unavailable eg 'ideally Tuesday morning or Thursday afternoon but we're in the area all week' or 'any time after 10 am Monday or before 2 pm Thursday' or 'any time Monday 10th June only'. This will help us to find a convenient day and time for you more quickly. It will also help us if we have to reschedule for any reason. Please tell us the ages of any children (we will not book 3 year olds with 20 year olds wanting as much fun as possible!) and any special requirements you may have eg if you are nervous of boats, if you need a dog friendly trip or no dogs on board. Most trips do not have dogs on board but we are dog friendly and regularly have canine passengers. Please see FAQs. Please note that for business purposes we define 'child' as 13 and under. We work hard to match passengers to like-minded passengers and appropriate sea conditions. Please tell us if you particularly want to do the Family Wet and Wild (wildlife and fun, suitable for all ages) or would prefer a trip tailored to older children and adults and we'll do our best to accommodate you subject to sea conditions etc. It is essential that you advise us of any medical condition (eg diabetes, epilepsy, heart or lung problems) or injury which may affect your enjoyment or safety on board, which could make accessing the boat difficult or which could be adversely affected by a boat trip (eg pregnancy, neck or back problems). Our standard terms apply to cancellations. Paypal payments will be refunded via Paypal. Please note: this is an online reservation subject to sea and weather conditions and availability. It is not a confirmed booking until we send you confirmation by email or text. For your own convenience it is not usually advisable to reserve online for trips due to depart in the next 24 hours. If you book online for a trip in the next 24 hours and you have not received confirmation from us by 8 pm the evening before or 9 am the morning of the trip (depending on when you booked) please call us on +44 (0)1348 837764 to confirm availability. If for any reason we are unable to run a suitable trip at a time when you are available then you will be given the choice of rescheduling or cancelling with full refund. Please read our FAQs and Terms and Conditions carefully. By booking you are deemed to have accepted them. If you have any questions please don't hesitate to call us or email us at info@venturejet.co.uk and we'll do our best to help. Full instructions and directions to departure point will be sent with the confirmation email or text or you can download the pdf guide below.